I just finished today the 9 mornings novena for the preparation of the coming of the Lord Jesus Christ which is known here as the "Simbang Gabi"
It starts on December 16 and ends at December 24..the eve of Christmas. A 9-morning mass celebrated usually at 4 o'clock in the morning in devotion to the coming of the Messiah. A tradition by the Filipinos originally intended for the farmers who cannot attend the usual morning mass which is 7:30am . 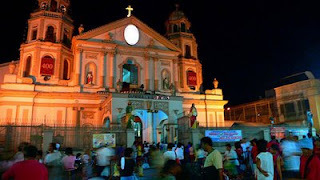 Simbang Gabi is incomplete without the bibingkas and puto bungbongs sold in front of the churches. It is believed that if you attend all 9 masses you can make a wish and it will come true one way or another, a tradition that has been passed down from generation to generation. The validity of the said claim may or may not be true, many Catholics still wake up in the morning and attend the novena masses. I think it is within yourself your wishes can possibly come true.